Egg and cress makes me think of summer. I love it in sandwiches (I know lots of people don’t). Especially on a nice crispy white roll or baguette. But recently I’ve been flipping through @Scandilicious new book The Secrets of Scandinavian Cooking and there’s quite a few open sandwiches with an eggy theme. 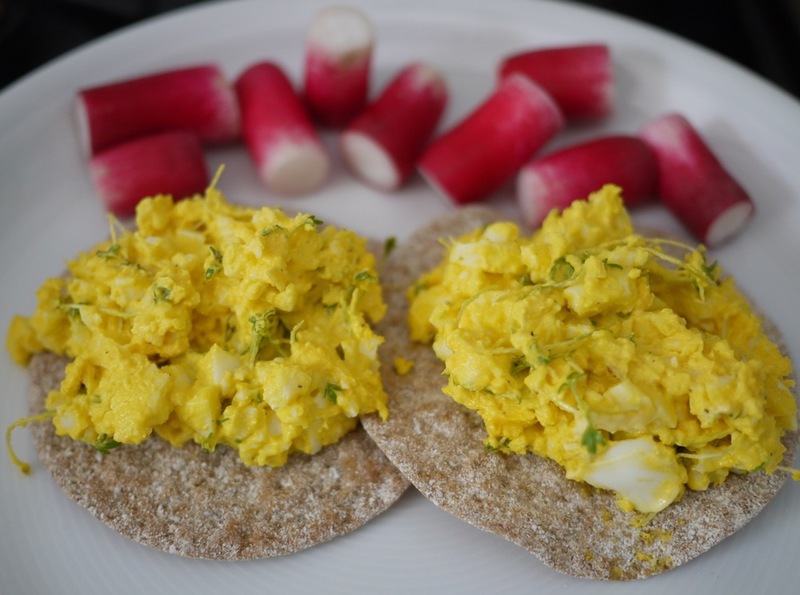 So I decided why not try egg and cress on lovely @PetersYard crispbreads for a quick lunch. Wow it was fab. Helped of course that I had home grown cress and bantam eggs gifted from a friend. Perfect with some crunchy breakfast radish on the side. This morning two people tweeted they were having yummy sounding eggy breakfasts. @Ailbhetweets was having eggs with dippy soldiers. 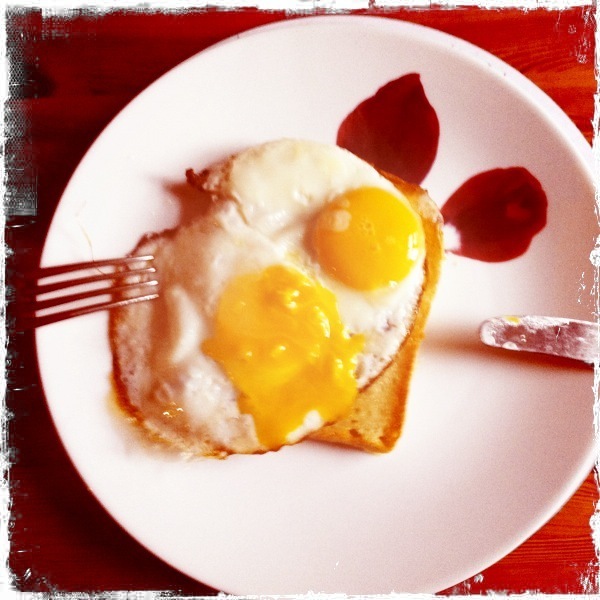 @leafhsetherapy was having poached eggies on toast. I think it is both their birthdays so they kind of deserve eggy breakfast. Me, its not my birthday, but hey I fancied eggs anyway so I had fried on toast mmmm. It’s Tuesday, it’s damp. Why ever not have eggy breakfast I say! Some things in life are both functional and hold wonderful memories. A memento doesn’t have to be pretty or fancy to remind you of great times, great people or great places. Simple things often hold more meaning. Like my old egg slicer. 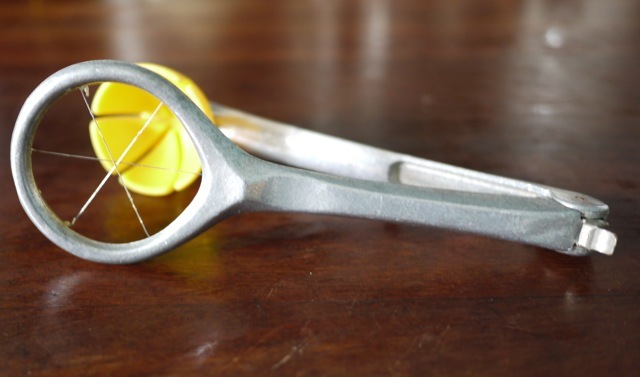 This isn’t an ordinary egg slicer that cuts the egg into rounds. 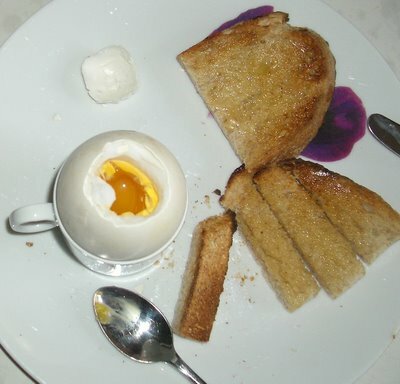 No its much better than that it cuts the egg in to sixths vertically. And when I was a child and we visited on Sundays he always made a huge spread of food for us to eat and without fail there would be hard boiled eggs. I would always slice the eggs with him. Holding the egg slicer carefully, balancing each egg in the yolk coloured cup and pushing the wireframe down firmly but gently, his hands steadying mine. So now each time I have hard boiled eggs I can also remember my grandfather and all the other ways he shaped my life. 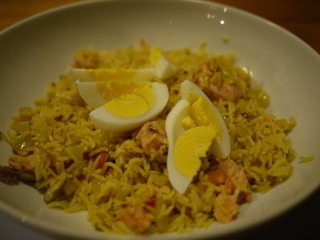 I like kedgeree. A lot. Its simple to make and always tasty. It makes a great light dinner dish. Its even easier when you use smoked fish that doesn’t need any cooking. Last night I used Pinney’s of Orford hot smoked salmon. I made the rice quite spicy because this fish is quite rich. Yum. Last week I got a couple (one each for hubby and me) of goose eggs via a friend. I was very excited, as I’ve never tried either duck or goose eggs before. 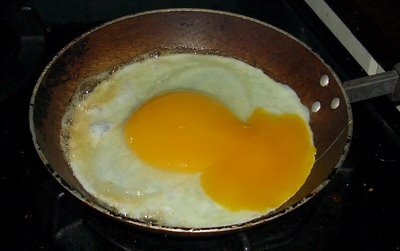 Everyone I mentioned it to said they are much much richer than hens eggs and then proceeded to suggest the best way to have them – most favoured fried or scrambled. I umm’d and ahhh’d for quite a while and then decided that what I really wanted was soft boiled with soldiers (hubby decided on fried for his egg). Having made my decision could I find any books that told me how long to boil a goose egg for? NO. Hugh F-W let me down big time here – I thought he was bound to be waxing lyrical about goose eggs and giving cooking times but not anywhere I could find he wasn’t – honestly Hugh call yourself a converted country boy and you don’t mention goose eggs, just what’s the world coming to? Then I saw that Rose Prince mentions them – hurrah I thought, instructions here we come – but it was another blank – she tells us how much her five year old son really likes soft boiled goose egg as a tea time treat and also his views on how big they are (in which he demonstrates a fine grasp of the f word) but not how to cook them to perfection. So off to the computer to see if that helped – and a quick Google search came up with the goods straightaway. Next a search in the cupboards for something to stand the egg in to eat it – at about 2½ times the weight of a hens egg it looked a bit big for a regular egg cup (even my lovely spotty Emma Bridgewater one which seems to be designed for extra big hens eggs was only going to provide a comedy moment and an unsecure stand). After much searching about and trying different tea and coffee cups I finally found a coffee cup that was a perfect fit. Back in the kitchen it was time for breakfast. Into a pan of luke warm water went my goose egg, brought it up to a simmer and then cooked at that pace for 10 minutes (next time I’d do it for a little less to get a more runny yolk), hubby fried his egg for around 4 minutes or so and we dashed off some toast for each of us. Then to eating. 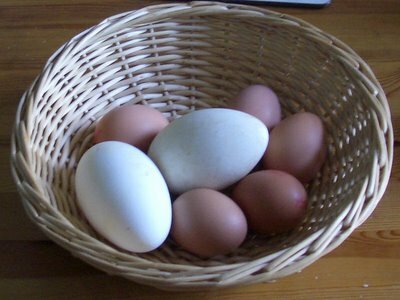 The white is a more boingy texture than a hen’s egg and a different shade of white (kind of translucent even when cooked) but similar in taste. The yolk is huge, a lovely yellow and to start with you think its not that much richer than hen’s eggs but at you munch your way through you realise its kind of cumulative and by the end I was hard pushed to think I’d want another bite. It was truly delicious, a great treat for a Sunday breakfast and next time I see any I’ll be getting another couple. I’ve been blogging now for a couple of months and I’ve been looking at some of the other food blogs out there to see what goes on in the food blogging community. I noticed that some bloggers run ‘events’ as part of what they do and I thought it might be fun to join in now that I’m starting to get used to (or possibly obsessed by) the whole blogging thing. Early on I’d seen the ‘In the bag’ monthly event that is run jointly by Julia at ‘A Slice of Cherry Pie’ and Scott at ‘Real Epicurean’ and was disappointed to have missed out on the January deadline; then I got so absorbed in playing with my blog, adding (and subtracting) widgets, reading Blogging for Dummies, checking out other blogs – you all know how it is I guess you’ve been there too – that I didn’t spot February’s ‘bag’ until it was so close to the deadline I knew I wouldn’t have time to think something up. 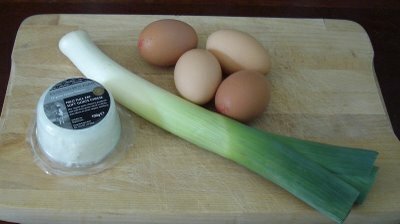 So as not to miss out again I watched closely for March’s bag to be announced and then got to thinking about what I could do with these three ingredients (leeks, cheese and eggs) which feature frequently in my cooking but, I immediately realised, rarely in one dish. 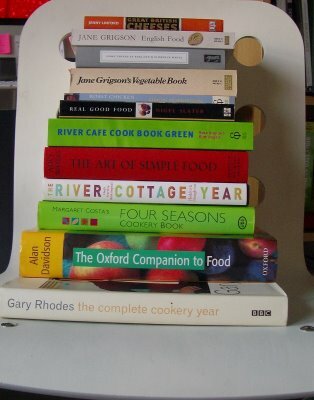 So off I went to do some researching in my various cookbooks. As leeks seemed to be the key ingredient I started by looking for different ways with them that also used both eggs and cheese (for this first attempt I didn’t want to drop one of the ingredients even though you are allowed to, that seemed way too easy). There were plenty of choices with leeks and cheese and a few with leeks and eggs but little that combined all three beyond the inevitable leek and cheese flan/tart/quiche – delicious but very obvious – I was hoping for something a little different and also a dish that could perhaps become a new favourite in my cooking. I did spot a leeky Welsh rarebit recipe in Hugh F-W’s River Cottage Year that looked rather tasty but decided it felt a little too much like a hearty winter dish and I wanted something that would work well as a fresh and light spring dish. I was also reminded how versatile leeks are, its so easy to fall to just steaming them and serving as a side dish when with a little imagination they could shine in their own right. 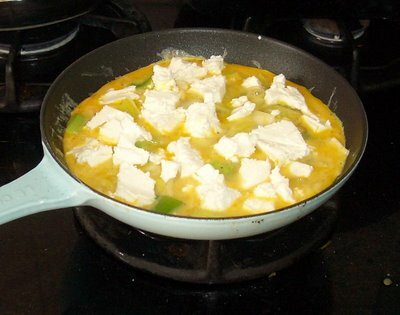 A la grecque (Jane Grigson’s Vegetable Book and Margaret Costa, Four Seasons Cookery Book) – fundamental flaw with this one was that it didn’t use the eggs or the cheese – oops! But it is delicious. With pasta in a kind of vegetarian carbonara style or with homemade pasta (using the eggs) and a leeky cheesy sauce (any Italian cookbook will help). As a kind of French onion style soup with a nice melted cheese crouton (I think this was from a Jamie Oliver book where he does a three types of onion soup – I think its Jamie at Home but can’t seem to locate it right now – sorry). In a risotto (any Italian cookbook). And so it went on – lots of fun delving in recipe books, finding great ideas, discounting them because they either didn’t use all three ingredients or they didn’t seem to fit with the fact the weather was getting wonderfully spring like. I was beginning to think that I wouldn’t be submitting again this time……. in the chapters devoted to March and April (with wild salad leaves, with sorrel, with spinach and prosciutto). 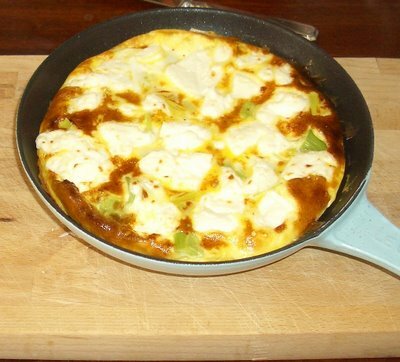 Something started to stir – I really like frittata and other similar styles of omelette and I often cook one with a delicious fresh cheese called Buxlow Wonmil that I get when I’m in Suffolk. So off to the supermarket this morning to get the ingredients (sadly there isn’t a farmers market near where I live other than going into London to Borough market, which I love but rarely have time for, hence a huge reliance on the local Waitrose.). There was no sorrel left but I did find some English watercress and had to settle for some French lambs lettuce as none of the leaves seemed to be English just yet. So here’s the recipe. The Leek: Top and tail the leek and cut into chunks about 1 inch in length then slice these into quarters, rinse the leek thoroughly to remove any grit and drain or spin in a salad spinner. Heat a little butter in an omelette or other shallow pan (of about 6-7” in diameter). 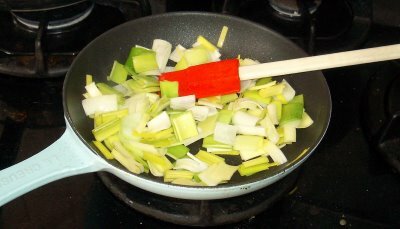 Add the leeks and allow them to soften for a maximum of 5 minutes, you are aiming for them to retain some of their crunch. The eggs: break the eggs into a bowl; add a splash of milk and some salt and pepper. As soon as the leeks have softened a little pour the eggs into the pan and allow to cook slightly. Draw in parts of the sides a few times to create a little fluffiness in the texture. 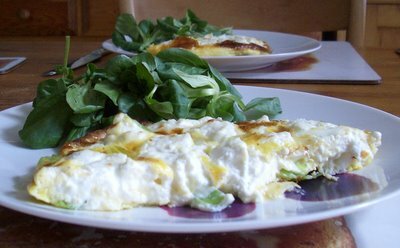 Once you think you have a good base but the eggs are still runny for most of the depth then…..
Add the cheese, which you have crumbled or cut into small chunks. Cook for a little longer and then pop the pan under the grill (be careful with the handle if its not heat proof) to cook the frittata from the top. This will take about 3-4 minutes if the grill is hot. Remove from the grill and allow to cool slightly, slice and serve with your chosen salad leaves. I was pretty pleased with the result, the leek flavours showed through well and they were soft enough but still with some bite, the cheese contrasted with them nicely and had a good tang and the salad leaves (dressed with just a little extra virgin rapeseed oil) made for a nice soft balance. I think probably the whole goats cheese was a little too much as the egg flavour was a bit lost so when I make this again I’d probably scale back to ½ of the cheese. I really enjoyed the whole ‘In the bag’ challenge; it made me think about some ingredients differently, gave me chance to read lots of recipe books and generated lots of ideas for ways to have leeks that I’d either forgotten or not thought of before. So I’ll be looking forward to whatever is ‘In the bag’ in April. Last week I mentioned lemon curd in my Labour of love post and one comment poster asked for a good recipe. I’ve tried a few versions in the past – some come out fairly runny, some very thick. They all taste good but the texture and richness varies quite widely depending on the amount of butter and also egg yolks (some recipes use whole eggs some use a mix and some use only yolks). So there’s quite a lot of choices in picking a recipe. I’m going to give you two recipes here – one for a good staple curd – not too runny not too rich and one very rich one. First the good staple which comes from Hilare Walden’s Sensational Preserves book (with various of my comments added). I’ve made it a number of times always with great success. Grate the lemon zest – being careful not to end up with too much of the white (and bitter) pith and then juice the lemons. Put zest and juice in the bowl. Add the butter cut into about 1cm dice and the sugar. Put around an inch of boiling water in the pan and then balance the bowl over the pan (the bottom of the bowl mustn’t touch the water) – this is called a ‘double boiler’ in case you see that phrase mentioned elsewhere. Keep the water just at simmering point and stir the mixture in the bowl as it dissolves. Beat the eggs lightly and then add them to the mixture (most recipes tell you to strain the egg mix but I don’t think this is really necessary). And keep on stirring. For as long as it takes for the curd to thicken which might be anything from 15 to almost 40 minutes (dependent mainly on the amount of lemon juice, I think). Make sure the curd doesn’t get too hot and keep on stirring especially as it gets thicker or you’ll end up with curdled curd – not a good result. Pour into warm, clean dry jars – straight from the dishwasher is a good way to achieve this and seal with wax paper disks if you have them and a lid. Putting the lid on while its all still warm helps create a vacuum and so the contents last for longer. Store somewhere cool and dark and in the fridge once opened. It’ll last 2-3 weeks once opened – well it will if it doesn’t all get eaten before then. Makes about 1 ½ lb (a normal jam jar fits roughly 1lb). The richer (and it really is much richer almost too rich except in small quantities) comes from Gary Rhodes’ Complete Rhodes around Britain. It uses essentially the same technique but the ingredients are heavily weighted to butter and egg yolks. In fact it’s the kind of recipe where you need to have thought through what you are going to be doing with all the egg whites you end up with (e.g. make meringues). 3 lemons, 8oz (225g) unsalted butter (I told you it was rich), 8oz (225g) caster sugar and 5 (yes that FIVE) egg yolks. Proceed as above but spread more thinly when applying to toast. I’d recommend you try the Walden recipe first and then the Gary Rhodes if you fancy a rich lemony blow out experience at a later date. And if you think all that stirring is too much then try an upmarket ready made lemon curd – I most recently had the Duchy Originals one – very tasty, almost good enough to tempt you to scoop it out and put in your own labelled jar to pass off as your own ?